2). In the text box BELOW the item on the checkout page, write the size that you would like it cut to. 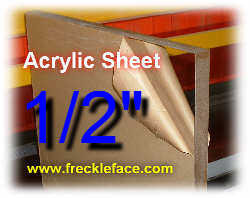 Specify the size in whole and fractional INCHES. Example: 23 X 16-1/4. No need to put inch marks ("). We will consider all figures to be inches-DO NOT SPECIFY IN FEET. Do not put any other information in the text box, only the size. 3). Checkout, or continue shopping. That's it! 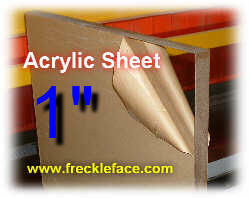 We will custom cut it to your specified size, we keep any cutoff pieces. A). We will not cut a piece into many smaller pieces, we will only reduce it to one size. We keep any cutoffs. We cannot do shapes other than a square or rectangle. B.) 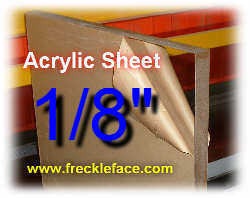 Except as noted above, cutting tolerance is +/- 1/16". 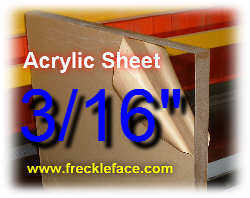 This means that your piece may be over or under your requested size by 1/16". 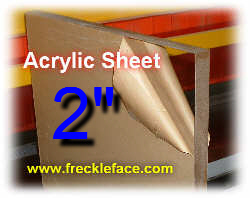 Note that the initial tolerance of the piece we begin with is +/- 1/4", which may affect your requested size. 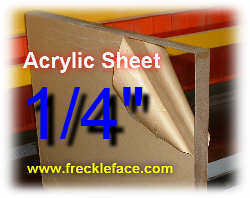 As an example, say you wanted our 1/4 X 24 X 24 custom cut to 24 X 19. 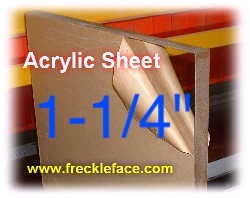 Since the piece we start with is already 1/4" undersize due to the initial tolerance, we are cutting from a piece that is actually 23-3/4 X 23-3/4. Therefore, the piece we send you will be actually 23-3/4 X 19. If it had to be exactly 24, you would have to order a larger size. We cannot accept returns because you failed to recognize this, so please be sure! C). Edges are sawcut. We do not finish edges. Because of tolerance and thickness variations, do not expect all pieces to fit together properly if you are building a box, aquarium, etc. Finish sizing is up to you. D). If you are ordering MANY of the same item and only want SOME of them custom cut, enter them separately. For example, if you want 5 pieces 24 X 24 but only need 2 of them custom cut, place '2' in the quantity box, add it to your cart, then specify the custom size. Then go back to that page and put '3' in the quantity box and add it to your cart. E). Cutting charges will be added. 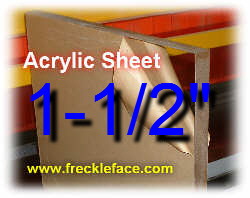 Please Note: On all plastic materials, dimensions are in INCHES unless otherwise specified. 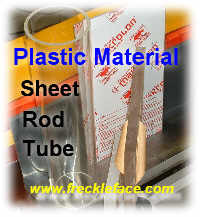 Protective masking on materials, if any, may be paper, film, or both. MOTOR FREIGHT ONLY items have a separate minimum requirement. See our faq page. USA Orders/Payment Only. Prices are in US Dollars. Note that we do not ship FedEx or Motor Freight to post office boxes. Great prices for 23 years. No middleman. Warehouse to your house.